I need to applaud Acorn Media on digging into the BBC archives and pulling up this rarely seen production from 1975. This is the sort of historical drama that I would expect to see from that era. Now, that will mean different things to different people but to me this is a good thing. It’s sort of like I Claudius in the way that it may not be everybody’s cup of tea but I personally love it. 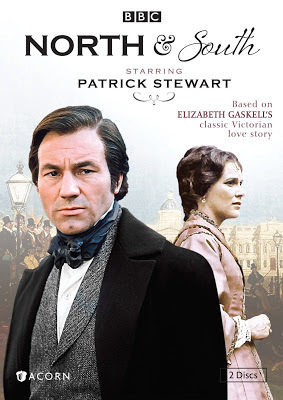 This is the second of three BBC productions based on this novel by Elizabeth Gaskell. The first one was produced in 1966 and sadly no longer exists in the BBC archives. The most recent one was broadcast in 2004. 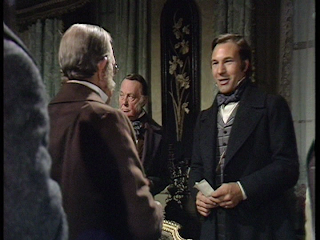 Like I said, this production was exactly what I expected for a 1975 BBC production. This is based off of the 1855 novel from Elizabeth Gaskell. It focuses on Margaret Hale who had lived a great portion of her life living in London and brought up in the socialite scene. When we join the story, she is about to go back to where she was born, Helstone, to live with her family. For many of her friends in London, they had thought Margaret lived in London because of the ill-health of her mother but the truth is more to do with how her mother’s family thought she married below her social standing. Margaret cannot wait to get Helstone and start a new life. Almost immediately upon her return to Helstone, Margaret is faced with some bad news. 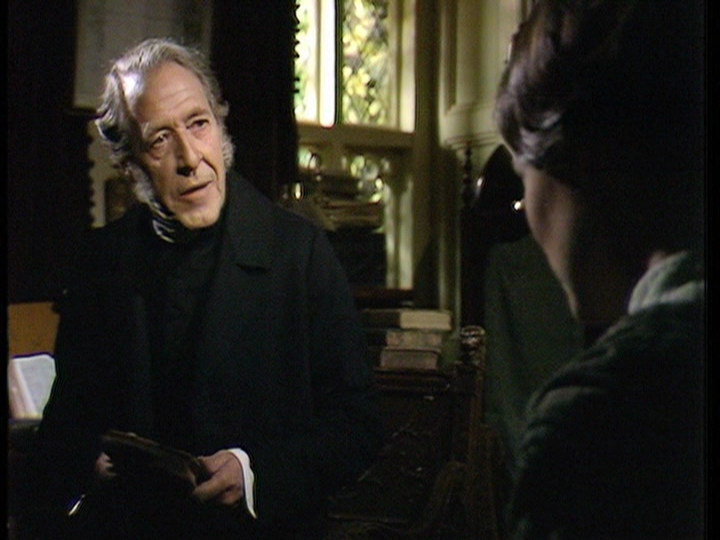 Her father Richard was the pastor in Helstone and decided to leave the Church of England. Doing so means he gives up living in the rectory and moving. Richard’s friend from Oxford and Margaret’s Godfather Mr. Bell suggests that the Hales move up to Milton which is an industrial town up north. This is where it gets interesting. There is a cultural and social divide with people from the North and people in London going down to the South. It appears that everyone from London and South of London looks down on industrial cities in the North such as Manchester which is what the fictional town of Milton is based from for this story. Mr. Bell owns a great deal of property in Milton and is able to get the Hales a house to live in. The reason why Richard Hale is excited to be up in Milton is that he is able to be a tutor. 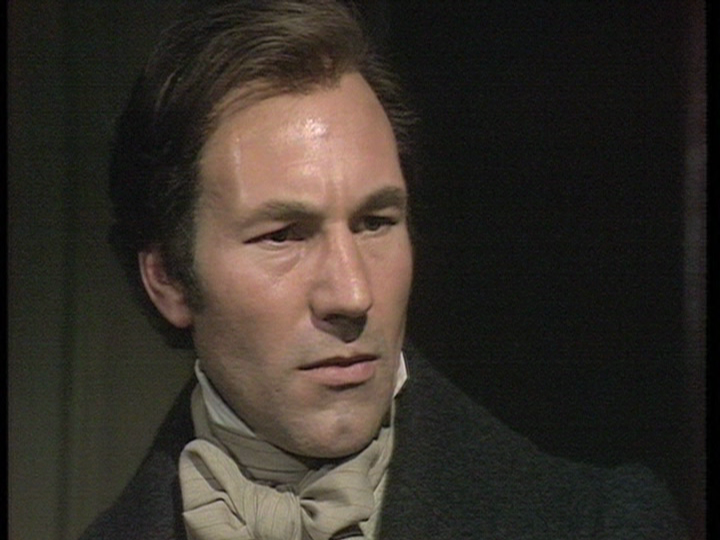 His student is the rich and influential manufacturer John Thornton (Patrick Stewart) who runs a cotton mill. Hale is excited to be tutoring Thornton because he picks up the lessons so well and is eager to learn. The two men are able to engage in diverse conversation and become good friends. 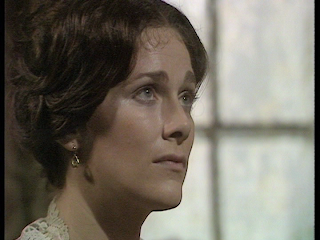 Margaret is having a harder time finding anything likeable in John Thornton. Margaret has an immediate dislike for Milton. 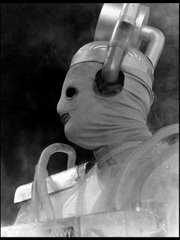 Unlike the gentle country of Helstone, Milton is dark, dreary and black from the dirty soot and smoke that fills the air. The sun rarely comes out and it is a depressing place. Margaret befriends Higgins family. Their father Nicholas Higgins is a worker at the mill. His daughter Bessy also worked at the mill but the suffocating conditions of the cotton room at the mill, where she worked, has made her extremely ill. Her lungs are literally filled up with cotton particles and she is too sick to do anything. It is with this that Margaret sees the harsher and unfortunate side to the manufacturing conditions in Milton. This is why she has an immediate dislike for John Thornton. From the very start the two cannot have a conversation without immediately showing their disagreements. 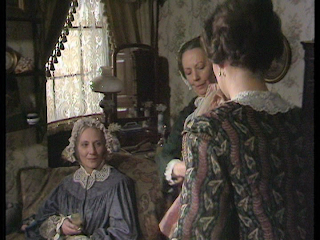 With Margaret seeing how the people live in Milton contrary to the wealth that Thornton and his family is living in makes her angry with Thornton. On the other hand, Thornton is immediately infatuated with Margaret. Thornton totally sees how Margaret sees him and may almost sympathize with it. For being a manufacturer in Milton who is quite wealthy, Thornton does not stop wanting to better himself. After working a full day at the mill, he gets tutored by Richard Hale. This is a good thing yet Thornton’s own mother, Hannah Thornton, almost looks down at this action. She is a strong-willed woman. It would almost be possible to think she is a classic evil mother character such as Livia (once again from I Claudius) but she isn’t. She is very determined and very cold but I felt she actually loved her son and was protective of all the work that had been done by John from all the years of building up his busienss. I think the character is open to interpretation and perhaps others have seen her differently. I think what makes this series so interesting to me is how many multi-layered themes there are in this story. 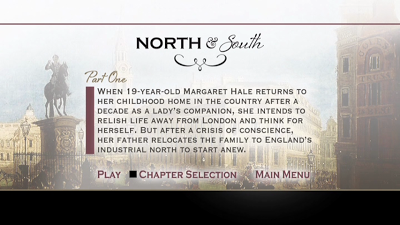 By the title alone, North & South, it would appear that the story would focus on Margaret being from the North and John being from the South but to me that wasn’t completely the focus. What was interesting to me was within that, you had the rich John Thornton in a time where money talked but he was still looked down by Margaret. It is clear, at first, that she almost saw all people from the North as primitive. It was almost like they thought of people from the North as uncivilized. It was sometimes shocking. This may had to do with the fact that John Thornton made all of his money through hard work opposed to coming from a rich family. He wasn’t an aristocrat. Another theme emerging was the idea of unions. The union in Milton was started by Nicholas Higgins. He wanted a fair wage for the men who worked at the mill. The men thought this was a great idea and a general strike broke out over Milton. This is unprecedented and Thornton was not going to stand for it. He brought in Irish workers who would work for cheaper and keep the mill running. This would lead to disastrous results for some. Margaret herself is interesting as she is outspoken to everyone. She is not the powerhouse woman role-model of Lillie or Louisa Leyton from The Duchess of Duke Street. She still speaks her mind to what she thinks is fair. 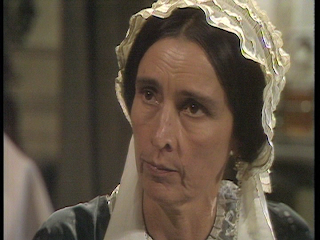 While the strike was going on, she repeatedly told John Thornton that the people he employed are starving while the strike is going on and would urge him to end it. This sort of talk was intriguing to Thornton but it made his mother despise Margaret. It is a wonder where Margaret got her strong will. Her father Richard was a self-admitted coward. It is clear that he did not like confrontation and often hid from it. He couldn’t even tell his wife, Maria, that he was leaving the Church of England; he had Margaret tell her while he was out. His cowardice is not done in a light-hearted way but one that highlights what a disappointment he could be as a father and a husband. In some ways, it actually feels like nothing happens in this story and I think that is a good thing. As mentioned earlier, Hannah Thornton, despises Margaret. I would have thought she would try and poison the relationship between John and Margaret. There are hints to it but it is so subtle, it doesn’t feel of any consequence. I was waiting for her to sabotage Margaret but it doesn’t really happen. Hannah certainly plants ideas into John’s head but he is too rational for it to stick. Everything that happens in this story is not in any way fanatical. When there are tense moments, they eventually calm. It’s realistic in that way. This is a love story with no love. I forget that in the nineteenth century any real showing of public display generally was kept to couples that were married. When Margaret is seen hugging another man at the train station, it is scandalous and could ruin Margaret’s reputation. Is there an innocent reason for this outlandish behavior? 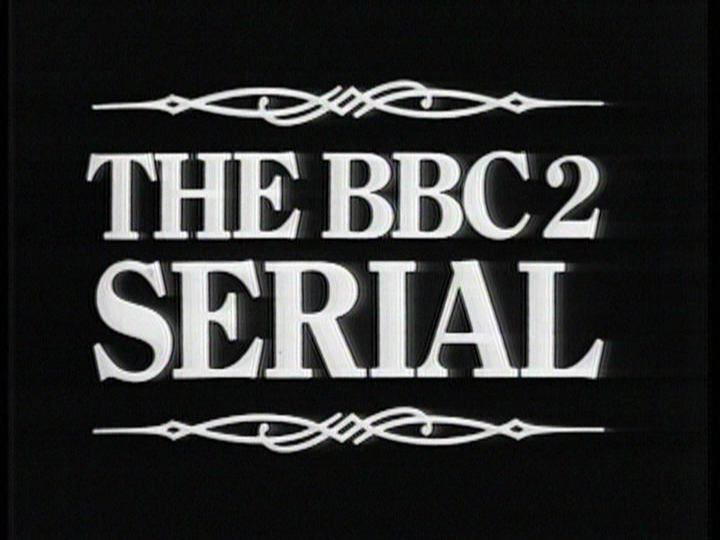 The production is a classic BBC historical. Yes, the dialogue is a bit stilted. It is stagey and could almost be confused in some ways of a send-up or satire of this type of historical drama but the dialogue is quite real. To me, it is a charm and some of the characters over-act while others are superb. Patrick Stewart is dynamic as John Thornton. Stewart acts a lot with his eyes. The eyes convey the emotion he wants to deliver. When he enters the scene, my eyes are just draw to him. I think Rosalind Shanks is less successful as Margaret. It may be that I did not appreciate her character but I did not find her very engaging. Robin Bailey as Mr. Hale is great. He is not a very strong character which Bailey plays perfectly. 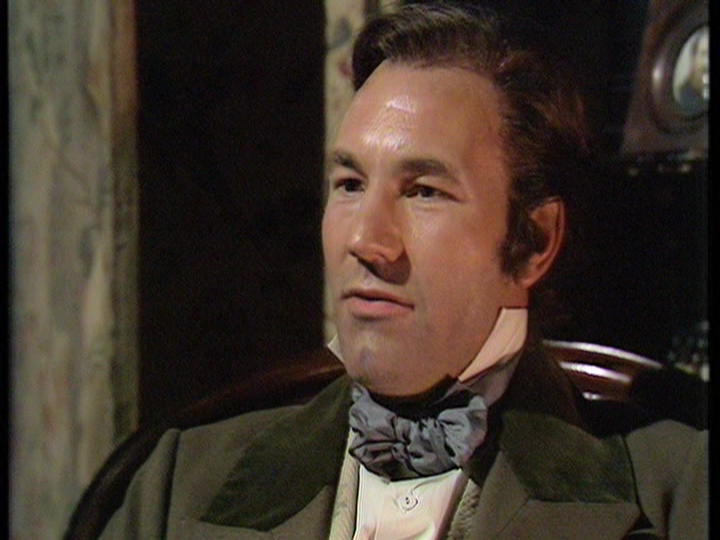 He plays sort of the opposite character as Mr. Justice Graves on Rumpole of the Bailey. He is phenomenal in that. In fact, probably my favourite episode of that series that features his character is Rumpole at Sea. If you have a chance to watch it, do so. It is a very enjoyable experience. Norman Jones plays Nicholas Higgins. I adore Norman Jones. If you follow British television, go to IMDB type his name in and see what comes up. He is a solid character actor. He plays Higgins with humility and strong morality. He is the exact opposite of what Margaret Hale would expect from someone from the North. This series had a lot of great actors who made appearances in this. 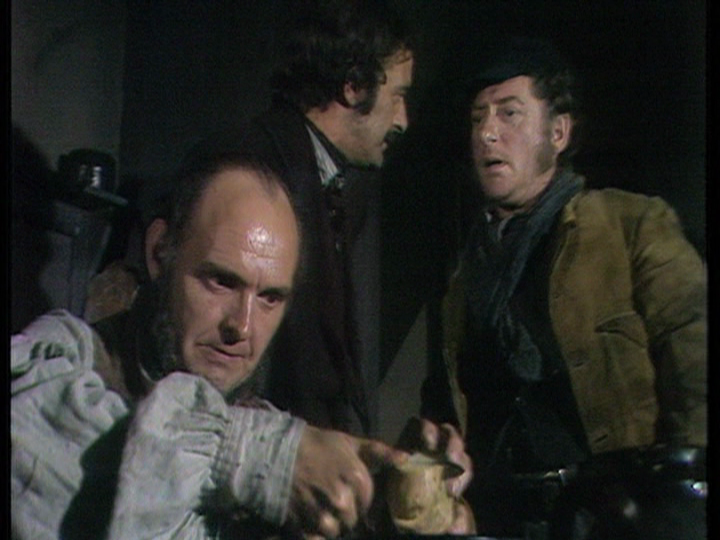 Ian Marter (Doctor Who), Frank Mills (Rumpole of the Bailey), Tim Piggot-Smith who also appears in the 2004 version as Richard Hale, Brian Wilde (The Last of the Summer Wine), and Cyril Luckham amongst many others. This production was directed by Rodney Bennett. He directed many other wonderful productions such as Z Cars, Doctor Who (The Masque of Mandragora with Norman Jones in it), Rumpole of the Bailey, The House of Elliot, and The Darling Buds of May. I was hooked on the series from the moment I saw the wonderful title sequence accompanied by the peaceful music of Dudley Simpson. I knew I was going to enjoy this series right from the start. I think the real star of this production is the Designer Tim Harvey. The sets are gorgeous and full of detail. There are a lot of different styles to the many sets that are required in this production. The color palette is interesting too. In Helstone and London the colors are more cheerful but in Milton everything is dark. The lower the class of person the darker and danker the set becomes. It is a real triumph and that is one of the aspects of the production I enjoyed the most. 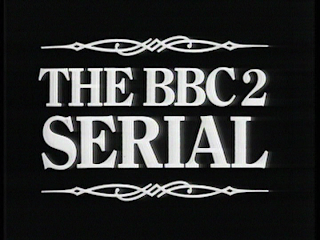 Although not an extra per se, I love the fact that Acorn retained the quick open titles for The BBC2 Serial. It’s a small thing but hugely gratifying. It could have easily been cut out but I really enjoyed it. Otherwise, there are no extras and quite frankly there is no need for any, in my opinion. I personally believe that when we are given a chance to see a production that lingered in the BBC archives for so long, I am fine to just enjoy the production. Though it might have been interesting to see them do a page of notes like they did for the Lillie release. This release includes some nomenclature that is familiar to anyone who has collected old British television series: “Due to the age of these programs and the improved resolution that DVD provides, you may notice occasional flaws in the image and audio on this DVD presentation that were beyond our ability to correct from the original materials.” This is an understatement and a curious one at that. If you look through my site, you will know that I have reviewed many, many programs from the 1950s through 2000s. I do consider myself an expert at the way these programs were made and how they should look now. There appears to be a filmic look to all of the interior scenes that were in studio. In the 1970s, the BBC generally recorded these productions with all interior studio scenes shot on video while all exterior scenes are shot on 16mm film. It is a very distinctive looked utilized by both BBC and ITV productions but mainly was from the BBC. All the interior scenes look like a poor version of a film filter put over it. It destroys the charm of the production. There are certain hallmarks to know when something is shot in studio on videotape but has a film look to it. One of them is how flame looks and also how light reflects off of shiny objects. Now, I looked and the BBC archive holds this on its original 2” video tape master. I don’t know what happened. In my mind, something went wrong downstream of the process of converting this series from PAL to NTSC to give the poor filmic look. Instead of just complaining about, I was curious if Acorn Media would have any idea of what had happened. The worst case scenario in my mind was that this was a new policy and they want to “equalize” the look of the production so it would all look like film. This doesn’t appear to be the case. It is true that no restoration work has been done on it and I am OK with that. The picture is very noisy and they are right that low light levels of the sets contribute to this. There are a lot of tape faults in this too. Once again, I am fine with that. I do disagree with their answer about why the video looks like film. I think other archive television enthusiasts like myself will notice and I think will be disappointed. Others will not notice it at all. It sounds like this issue with the quality is a one-off problem and hopefully will not happen again. 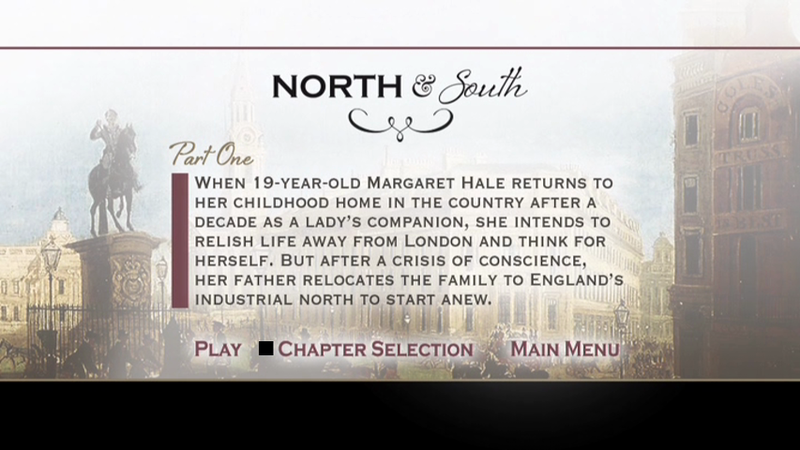 I wouldn’t let it stop anyone from getting it; North & South is too good of a series to have this stop anyone from doing that. If anyone gets this R1 DVD from the US, please let me know your thoughts on the quality! In fact, if you are in the UK and get the R2 release, please let me know if the studios scenes look like film or video. The DVDs are in a double Amary case with a simple yet handsome cover. It seems all Acorn Media discs now are silver with black printing. The full color DVD labels are apparently gone as I have gotten 3 titles to review and they are silver and black. Does this affect the value of the title? Not one bit but it is a nicety that appears to be gone now. On the menus, if you choose each episode individually, there is a title screen that gives a small synopsis of the episode. It is a nice touch. I don’t want anyone to leave this site without learning something. 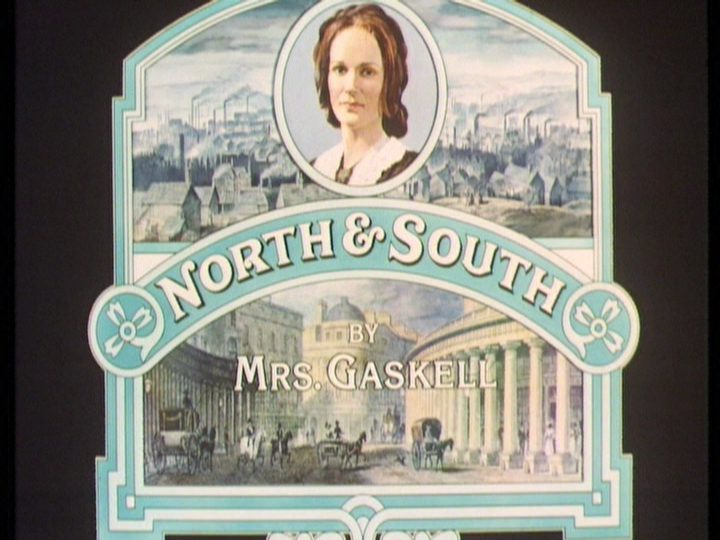 Elizabeth Gaskell who wrote North & South did not actually like the name to the book. She originally wanted to call it Margaret Hale. It was Charles Dickens who decided on the title. Dickens edited the book or at least the 20 weekly episodes from 1854 to 1855 in Household Words before being published as a full novel. He thought the title North & South covered more than just geographical locations of the North and South but also its capitalist manufacturers and poverty-stricken workers. This production interested me enough to do some research. It’s a fascinating period and this production is well worth the time to seek out and enjoy. It really does fire on all cylinders for me. Next week: I take a look at one of my favorite episodes of The Prisoner. The General has been one of my favorite episodes for years and I look closer at it in HD.